Rack systems are designed to meet a specific set of load and performance criteria based on the assumption that the components are intact and not damaged. Any time a component is damaged, the capacity/integrity of the system is reduced and compromised. Significant damage to a single component, or an accumulation of damage to multiple components in the system can lead to catastrophic failure putting employees at risk. What should you do when you find damage to the Rack System? 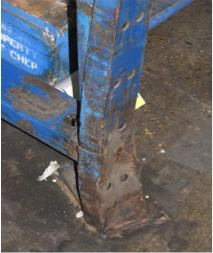 For damaged load beams, remove the loads from the beam and mark for repair. For damaged uprights (bent columns, sheared anchors, damaged struts, etc.) remove all of the loads that are above the damaged section of the rack in the two bays adjacent to the damaged upright and mark the rack for repair. Working with a qualified rack design engineer, document the damage to the rack and identify a strategy to repair the damage. In some cases the members can be straightened, in other cases it is easiest to simply replace with new parts, and at times it may work best to utilize a rack repair kit engineered for the specific application. The key thing to remember is to perform the work under the guidance of a qualified rack engineer who is evaluating the impact of the repair work on the entire system. Self-built and homemade remedies are extremely risky and should be avoided at all costs! Upright Frame damage: Unload all beam levels supported by the damaged frame. Beam Damage: Unload pallets supported by damaged beams. Minor Strut Damage: Contact engineer for direction. Home Made Repairs: Unload immediately.